Um. I’m going to need a minute after that episode. That was the craziest and grossest hour of television I’ve ever seen. Starting with the familiar sight of Will’s head being cut open with a saw, and including Mason wearing a face that isn’t his, a pig carrying a human baby, and an eel shoved down Mason’s throat, Hannibal outdid itself. And I loved every second — when I could look through my fingers at what was happening on screen. This episode was so many genres of horror mixed together: psychological, gothic, slasher, science fiction, grotesque, and a new genre Hannibal invented called “straight up insane.” And throughout it all, every shot was beautiful, and every line fantastic. "Digestivo" started by going back to show how Will and Hannibal got to the Verger farm, which I appreciated. (The first five minutes of the episode was about the last time everything was clear and logical.) The Italian police did interrupt Will, Jack, and Hannibal’s dinner, to the disappointment of Hannibal and the relief of everyone else. But then as the police were getting Will and Hannibal ready to send to the Vergers so they could collect their rewards, Chiyoh interrupted them. She shot the lollygaggers who were going to kill Jack so he couldn’t tell anyone what they did, and she pumped Jack for information on how to find Hannibal. Chiyoh is a ghost from Hannibal’s past, and throughout this episode she acted like an actual ghost by always lurking in the shadows and terrorizing her victims invisibly, from afar. She only made herself known to few, and to Jack she was a mysterious phantom who showed up out of nowhere to save his life. Jack must have ice in his veins because he did not flinch when Chiyoh shot the men around him (though maybe that was because of the drugs). Back at the Muskrat Farm, Will and Hannibal resume their dinner yet again, but this time with Mason instead of Jack. Mason tries to recreate Will and Hannibal as he knew them before — so he can tear them back down — but everything is a little off. The suits he puts them in are not quite their style (as if Hannibal would be caught dead in anything that wasn’t perfectly coordinated), and Will and Hannibal are both restrained. Despite all that, Hannibal looks like he’s having the time of his life. Mason may not be playing around, but Hannibal definitely is. Ever since Hannibal knew he was going to be caught, he’s begun to look a little more deranged and a lot less immaculate than normal. His hair is in his face, there’s often blood on his clothes, and his eyes are almost always in shadow. When Hannibal becomes undone, his appearance does also. But even if he’s the only one, he’s still having a good, funny time at the Verger estate. Mason’s mind games and torture peaks in this episode as he tells Hannibal exactly how he will cook him and he mocks Margot for wanting a child. He tells Margot that he really does have a surrogate for her, and that he saved her eggs so they could make a baby. But Margot finds out the surrogate is a pig from the Verger farm. That scene is so disturbing I almost can’t even talk about it. Mason is the most messed up villain on the most messed up show, and the scene when Margot finds the pig, hooked up to an ultrasound machine, with a mobile of tiny pigs above it, is where the gothic, sci-fi, psychological, and straight up insane horror is combined to create an unforgettable, horrifying sight. That Margot doesn’t give up right there shows how strong she really is. Meanwhile, Alana finds out Will is with Hannibal at the torture machine that is Mason’s dinner table, and she realizes she needs to adapt her plan. Her icy persona and manipulation this season has been partly to take back control of her life, but it was also to save Will, she tells him. She knew that he would go after Hannibal, and she wanted to get to Hannibal first. She can abide Hannibal being tortured, though maybe she would try to stop him from being killed. This new, powerful Alana is still Alana, after all. Last week she made it clear she had been scheming with Margot, and I love that the two of them are behind some of the biggest game changers this episode (but is Hannibal still pulling all the strings?). Margot and Alana have been disenfranchised by the men in their lives, and they have been working all season to get their power back. After being sidelined repeatedly, Margot and Alana free Hannibal so he can stop Mason and save Will, and then they finally kill Mason with Chekov’s eel (gross! It was gross). Hannibal has been trying to manipulate Margot into killing Mason since last season. And he finally achieved this when Margot stops Mason from shooting Alana. It could have been self-defense, or rather, defending someone she cares about, but then Margot keeps going. She holds him under the water and lets the eel into his mouth. Hannibal may still be trying to manipulate Margot and Alana, but they see things more clearly than they have before. They know Hannibal and Mason, and they know their plans. They go along with Hannibal’s plan because that gets them closest to what they want. It may just be wishful thinking on my part, but I’m choosing to believe Alana and Margot are deciding to participate with Hannibal, rather than being manipulated into it. Because of Margot and Alana’s choices, Hannibal is freed and escapes with Will, and Margot may be able to get the child she wants after all. Chiyoh appears again, out of nowhere, to help by sniper shooting Mason’s henchmen so Hannibal is free to go. She shows herself to Hannibal, like an apparition in the snow, and she says she will watch over Hannibal, like a guardian angel. As Chyioh and Hannibal are talking about how some beasts should remain free, the camera views them though a window, making it look as if they are both behind bars. 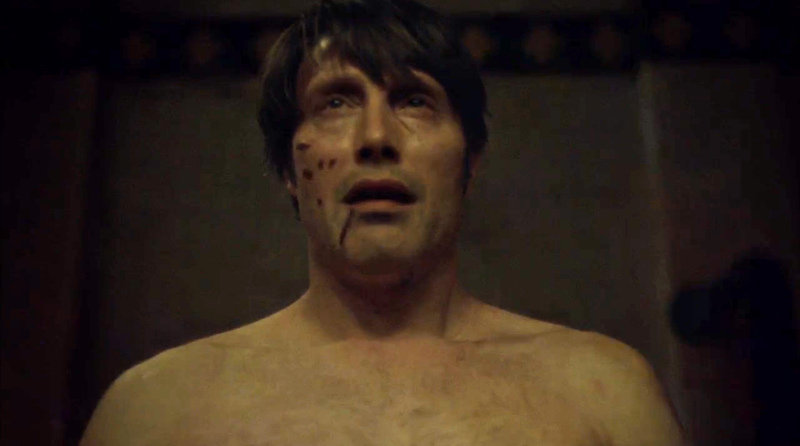 Hannibal’s fate is to be caught — we knew his fate before the show even began — but Chiyoh is in a prison of her own past. Just like Will. Hannibal visits Will’s bedside, and the two finally have the cruel goodbye that they have been teasing and building toward since they became entwined. 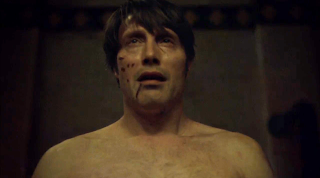 Will tells Hannibal that he won’t look for him, he doesn’t want to know what he’s doing, and he won’t miss him. So in possibly the cruelest manipulation yet, Hannibal turns himself in to Jack, finally, so that Will will always know where to find him. “I didn’t catch you. You surrendered.” Hannibal plays a long con, that is for darn sure. I missed Bedelia, but I’m not sure my heart could have taken any more this episode. Coolest shots in no particular order: the pig nursery mobile, Hannibal and Chiyoh behind the bars of the window, Hannibal emerging from his restraints like a monster rising from the ashes, Jack’s distorted face as he screams when Will’s head is being sawed, Mason floating and bloody in his own pool, Mason wearing an oozy, bloody, melting face. What was your favorite shot? I’ll see you next week — if I can handle it — as the show starts a new arc with the Red Dragon. First of all – thanks for all the work you’ve put in with the reviews so far and apologies for not commenting sooner, but I’ve really enjoyed reading them. There was a line (I think in the first episode) where Bedelia says to Hannibal something like “you no longer have ethics, only aesthetics” – I doubt it’s an original observation to say that that could be the motto for this season. The producers and directors no longer seem to care overmuch if the story makes sense (or even if there is one, but by damn they care about making everything beautiful. Every single camera angle seems to have been chosen for no other reason than to delight the senses – the show has at times been a positively decadent feast of incomprehensibility. Following on from which – ah Firenze, mia bella signora. I’ve been to Florence, it really is almost as beautiful as it appears in the show (though artistic licence has been taken in several ways – this show makes Florence look as big as New York whereas it’s actually about the size of Manhattan, and the streets are permanently full of tourists, not grand and empty the way they were shown here), and they did an excellent job of making the city almost function as a character in it’s own right. The show will lose an important part of it’s aesthetic when it goes back to Maryland, sadly. It was also fascinating to observe in this episode that, if there is there one thing in this world that Hannibal genuinely loves, in a way that is neither selfish nor manipulative, it’s Florence. His grief as he realises he will never come back is one of the most genuine emotions we’ve seen from him. You’ve said it several times already, but Gillian Anderson has been outstanding this series. The way she’s managed to portray Bedelia, holding on to her sanity while simultaneously retaining Hannibal’s interest (because she knows that as soon as he tires of her he’ll kill and eat her) has been an outstanding performance. All the while (and in keeping with the aesthetic of the show) looking radiantly beautiful (my wife now wants the dress she was wearing in this episode…). I hope she hasn’t finished with the show, though I have difficulty in seeing how they can keep up the double act now Hannibal has been arrested. This goes back to a point I made earlier – when Hannibal is on the balcony of his apartment, trying to commit enough of the Florentine skyline to memory so he can sketch it without seeing it. This is a man who knows he will never see his one true love again. “you no longer have ethics, only aesthetics” // that is SUCH a great point! That really does capture what they are doing this season. I love the contrast between the bananas stuff that is happening and the beautiful way it looks. That is so true about Hannibal loving Florence. That is one time we've really seen him feel for something, other than Will. The way Florence was empty too just added to it feeling like a dream or a nightmare, where something is familiar but a little off. I will def miss the beauty of Europe, and Bedelia and Hannibal being beautiful in it. With Hannibal presumably off to jail, we probably won't see much more of him in his suits. Gillian Anderson has blown me away. She has such a complicated character, and she portrays all her emotions and makes it so lovely and entertaining to watch. I never would have expected to get that much complexity and fun out of the icy Bedelia we first met. Thanks so much for reading and commenting! I'm so excited for the next arc, but I also don't want the season to end!